DANVERS: Danvers Archivist Richard Trask speaks to young ambassadors from the Peabody Housing complex in London, England on Wednesday, April 6, 2016. 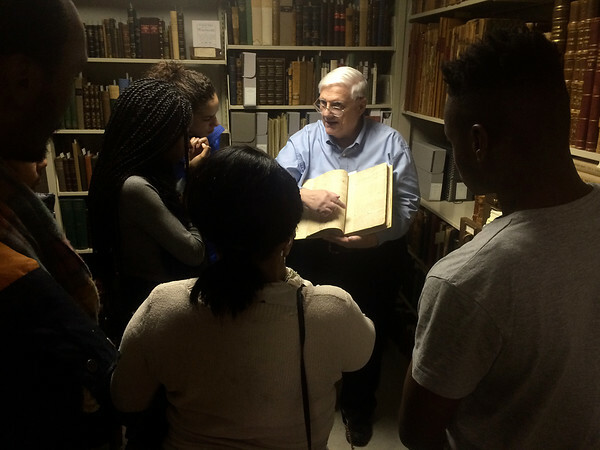 Philanthropist George Peabody paid for the construction of the housing, and the students are visiting the North Shore to learn more about the life of George Peabody. Here, Trask stands in the Danvers archives and holds the ministers records of Rev. Samuel Paris when he first makes mention of the 1692 witchcraft hysteria, "The devil hath been raised amongst us."